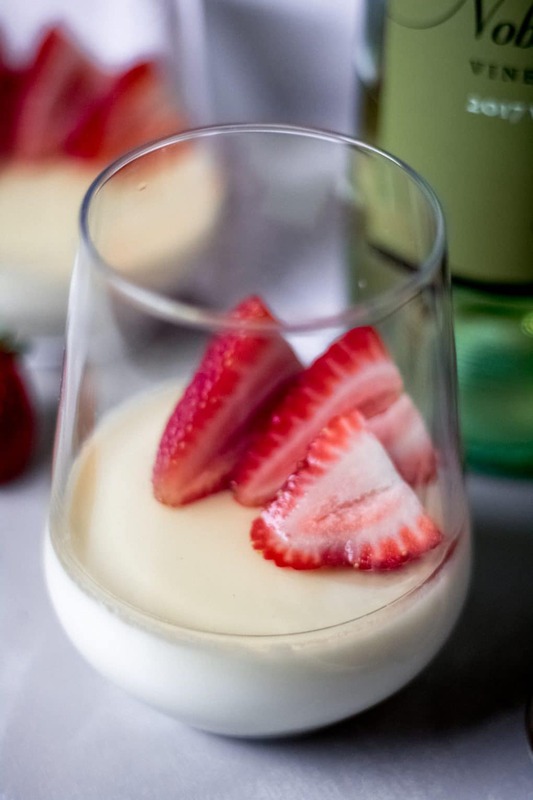 Curl up with your loved one and a dish of this vanilla panna cotta with white wine sauce. It’s the perfect dessert for dinner for two, being ridiculously easy and foolproof. 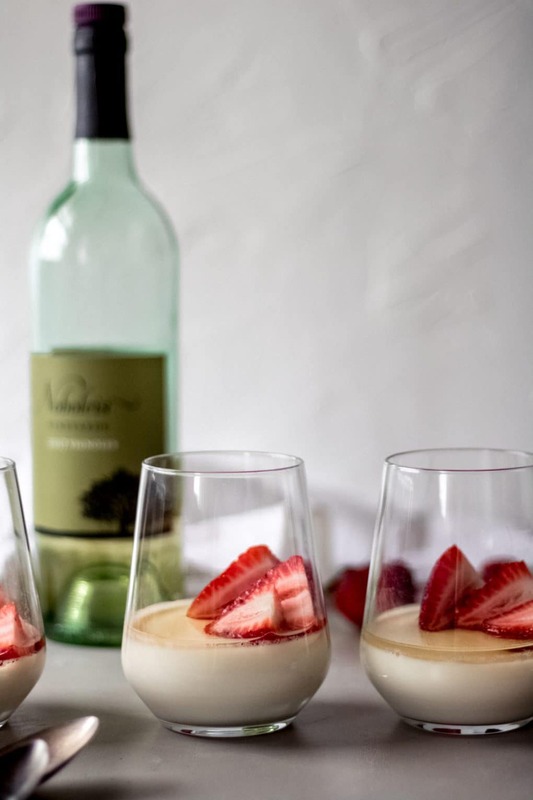 The rich and creamy vanilla panna cotta, paired with the sweet white wine sauce and fresh strawberries, creates a classic dessert that looks elegant and tastes delicious. Panna Cotta is an Italian dessert that is comprised of sweetened cream thickened with gelatin and then molded. The word Panna Cotta means “cooked cream” in Italian. It’s naturally gluten-free, too. 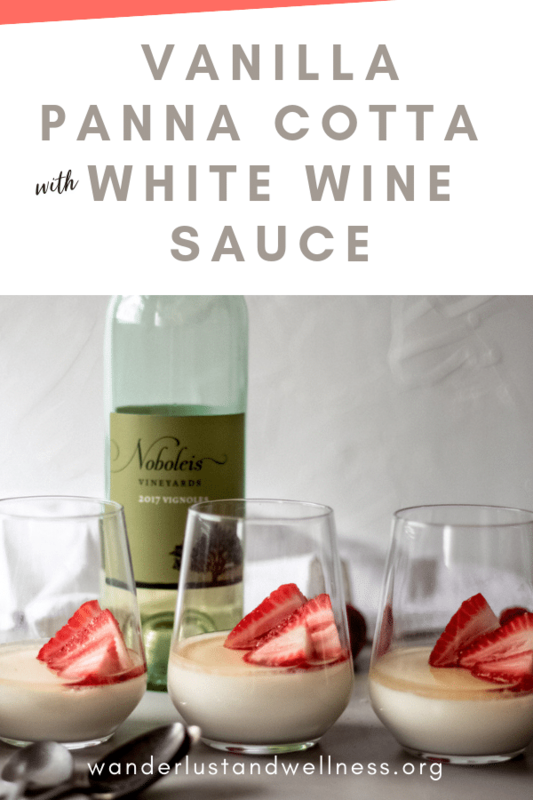 Panna Cotta can be molded into any shape you want, making it a fun dessert to create and style, however, for this recipe, we’re letting it mold inside a wine glass of your choice. Panna cotta is also quick, easy, and nearly foolproof, which makes it an easy go-to dessert. Add 1 cup Noboleis Vignoles (or other semi-sweet white wine) and 1 cup of sugar to a large saucepan and bring to a boil, then reduce heat and simmer. Stir occasionally to help dissolve the sugar. Let the mixture simmer and reduce down to about half, then remove from heat and let cool. It should thicken just a bit as it cools. Enjoy an elegant dinner for two! I’m hosting a virtual dinner party for two with a few fellow food bloggers! This dessert post is part of this celebration; enjoy their recipes below! 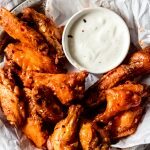 If you loved this recipe, check out these other recipes featuring Missouri wines! I’ve actually never made panna cotta, but it sounds easy enough that I probably should get to it ASAP!